Apple's 2018 MacBook Air debuted Tuesday, to much anticipation—over three long years' worth, since the prior generation launched in March, 2015. Yes, 2015, which might as well be the Carter Administration in computer years. For the new MacBook Air, Apple appears to have consulted our list of things the MacBook Air update needed to have. You know, like narrow bezels, fingerprint readers, a higher-resolution screen, Thunderbolt 3, and the latest-generation CPU. 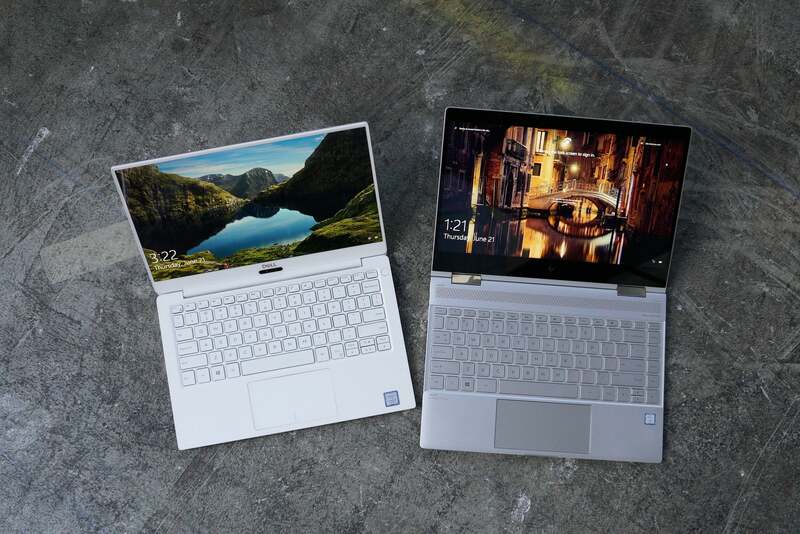 Things you can already get in some of the leading 13-inch ultraportable PCs, like Dell's XPS 13 and HP's Spectre x360 13—laptops that are refreshed once or twice a year. What a concept. Has the 2018 MacBook Air caught up with the rest of the world? Let's compare some specs and see. Here's what happens when you pit the new 2018 MacBook Air against the PC's best and brightest. The Dell XPS 13 is the laptop that set the stage for smaller bezels. When introduced three years ago, it was nearly as small as a MacBook Air, which at the time had an 11-inch display, but the XPS 13 had a 13.3-inch screen. Although Dell still carries an older version, Dell gave the XPS 13 a major redesign with the XPS 13 9370, the one we'll compare to the new Macbook Air. The only CPU detail we know about the MacBook Air is that it uses an "8th gen Core i5 dual-core." That doesn't say much, but Apple's website says the graphics are Intel UHD 617, which doesn't officially exist yet in Intel's database. Given that the CPU is a dual-core 8th-gen, it's likely the CPU could be a relative of this unannounced Core i7-8510Y, which popped up in a performance database with Intel UHD 617 graphics. Dell's XPS 13 9370 is one of the fastest ultraportables we've ever seen, and a formidable rival to the new Macbook Air 13. No matter which CPU it uses, we can tell you with a high degree of certainty that the Core i5-8250U or the Core i7-8550U option in the XPS 13 will smoke the 2018 MacBook Air. 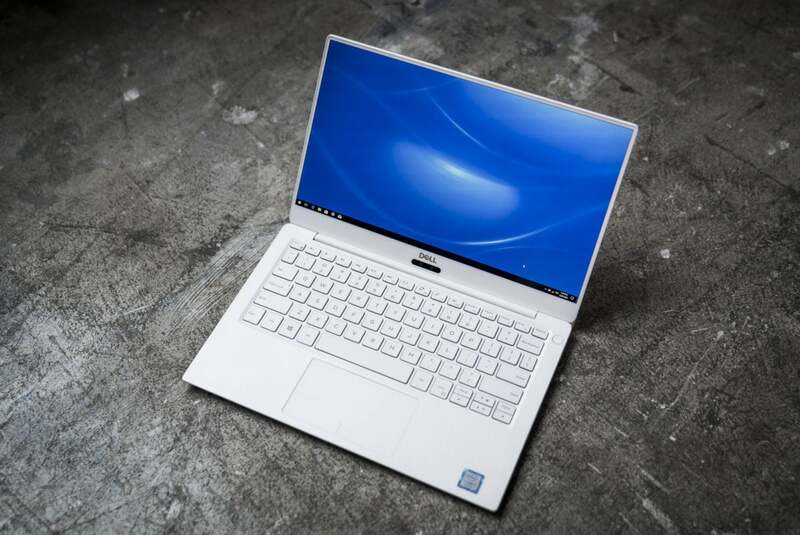 The Core i5 XPS 13 9370 is one of the fastest ultraportable laptops we've ever seen. We strongly suspect that even the cheapest Core i3 option in the cheapest XPS 13 will leave the new MacBook Air in the dust. Sure, you can argue that the CPU in the new MacBook Air is designed for low-power uses, but that also means someone can argue that it's designed for low-performance uses too. First, let's all welcome the MacBook Air to the world of high-resolution displays, because damn, that took a long time. To Apple's credit, it went for the gold with a 2560x1600-resolution screen. It's a respectable resolution when you consider that the default option on most 13.3-inch PC laptops is 1920x1080. In this category, we'll have to withhold judgement unless it's on something such as pixel count. If that were the case, the XPS 9370 gets the nod for its 3840x2160-resolution screen option. But the quality of the screen matters too, so we'll have to wait for independent reviews before scoring it. Apple finally integrated a fingerprint reader into the MacBook Air, which is cool. But the Dell XPS 13 is a step ahead with its infrared Windows Hello camera for facial recognition. While some Apple fans might argue that the Touch reader is better, wouldn't that be like arguing the Touch reader is better than the facial recognition on the iPhone X? We aren't super happy with the lack of USB Type-A on the New XPS 13 9370, but at least you get three USB-C ports. Why give people something when it's easier to take it away? The older MacBook Air features two USB Type-A ports, a dedicated charging port, headphone port, SD card reader, and Thunderbolt 2 port. The 2018 MacBook Air gives you two Thunderbolt 3 ports and a headphone port. So yeah, plug in your charger and your HDMI monitor, and you're out of ports. The situation on the Dell XPS 13 ain't much better, though. Dell gives you two Thunderbolt 3 ports, plus a third USB-C port that also supports charging and DisplayPort. Dell is technically the winner, but the big losers are USB Type-A and the laptop-using, dongle-dependent masses. 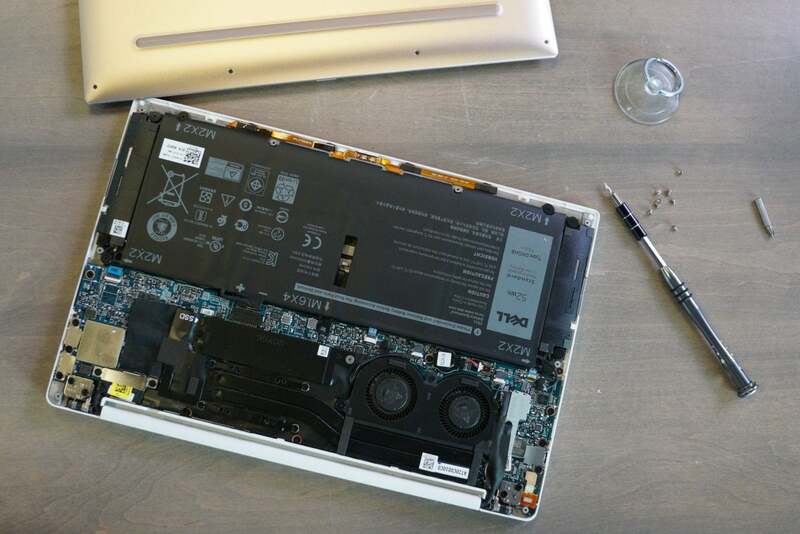 We didn't put upgradability on the list, but you can actually swap out the XPS 13's M.2 SSD. The MacBook Air has a fast, but permanent drive which rules out even storage upgrades. Apple specs the new 2018 MacBook Air at 2.75 pounds, which is basically what the XPS 13 is. Let's just call it a wash.
Apple claims about 13 hours of video run time using iTunes. We've measured the XPS 13 9570 at 13 hours of video run time using a local file, which is basically a tie, right? Well, yes and no. We agree that in the standard configuration, it's going to be a wash between these two laptops. We must note, however, that the new 2018 MacBook Air has a 2560x1600 resolution screen, while the standard XPS 13 9370 has a 1920x1080 panel. While we haven't tested the latest 4K-resolution screen in the XPS 13 9370, we're sure it puts a major dent battery life. For $1,200 the new MacBook Air gives you a low-power, dual-core Core i5, 1600p resolution screen, 8GB of LPDDR3 memory and a 128GB SSD. Dell's XPS 13 gives you a quad-core, high-performance Core i5-8250U, 8GB of LPDDR3 and a 256GB SSD for $130 less. To actually get storage parity with the XPS 13, you'd have to pay $1,400 for the higher-end MacBook Air. The last time we checked, $1,400 is more than $1,078. The HP Spectre x360 13 is among one of our favorite convertible laptops. 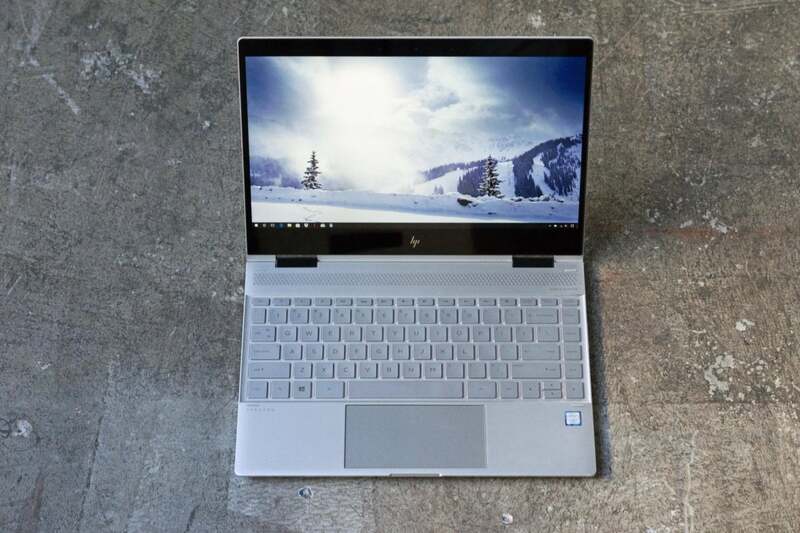 HP's Spectre x360 13 has been one of our favorite convertible laptops for a long time, proof that HP is always on the move. In the nearly four years since Apple last upgraded the MacBook Air, HP has iterated the Spectre x360 13 no fewer than three times. The latest convertible seems to have paved the way for the future of all laptops with pen, tablet and touch, combined into a super-thin, super light and feature-filled laptop. But hey MacBook Air, you got that Retina screen finally, right? Convertible laptops tend to be somewhat slower than clamshell laptops because of the more limited thermals you can put into a sometime-tablet. While that means the HP Spectre x360 13 might lose in a sprint compared to the XPS 13 9370, that doesn't mean it'll lose to a clamshell laptop using a low-power dual-core chip. Of course we'll have to wait until someone has tested the new 2018 MacBook Air's performance, but we're 95 percent certain the HP Spectre x360 13 is going to smoke the 2018 MacBook Air in every single CPU performance task that matters. 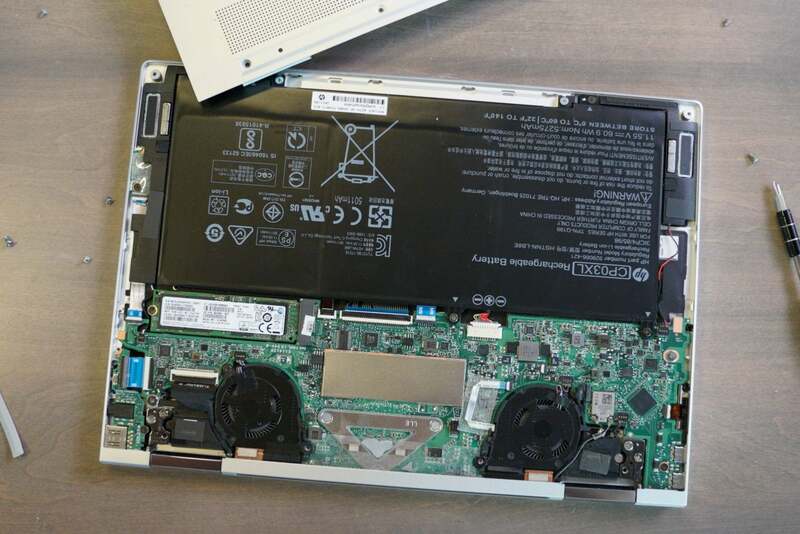 We didn't mention upgrades, but the HP lets you actually do that to your SSD. The new MacBook Air? Fuhgetaboutit. The 2018 MacBook Air gets the nod for screen resolution, and Apple tends to be exceedingly picky in display quality. But there are more things to life than pixels. As it is a convertible, all HP Spectre x360 13 laptops feature a 10-point touchscreen. If you want to argue that touch is irrelevant on a personal electronic device, we'd like to sell you a classic BlackBerry, too. Besides the touchscreen, HP also includes pen support. So yeah, we gotta say, if you're only going to look at pixels (there is a 4K option on the HP too, incidentally), the MacBook Air wins. But we'd take pen and touch on the HP's IPS panel over a higher-resolution panel. The new MacBook Air finally gets a biometric fingerprint reader. 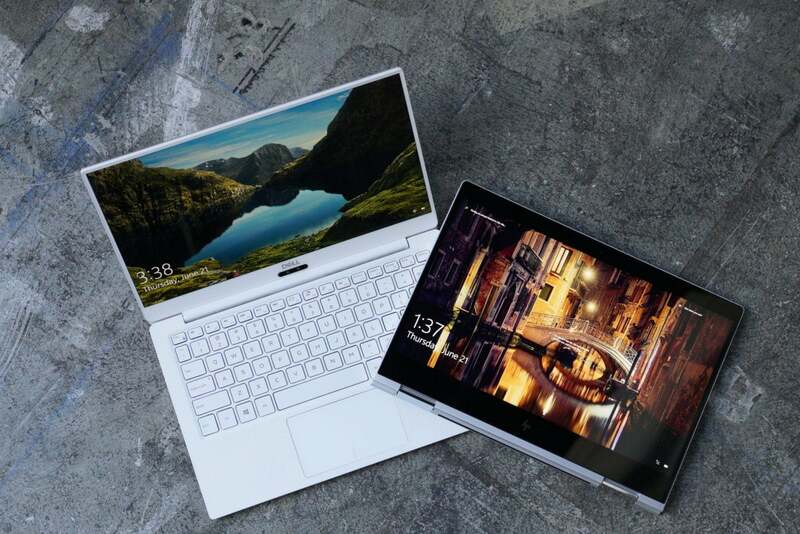 The Spectre x360 13 sees the fingerprint reader and raises the ante with biometric facial recognition. And if you think that's not a big deal, tell it to the iPhone X. The HP (bottom) includes USB Type A so you don't need a dongle. It's just no contest here. 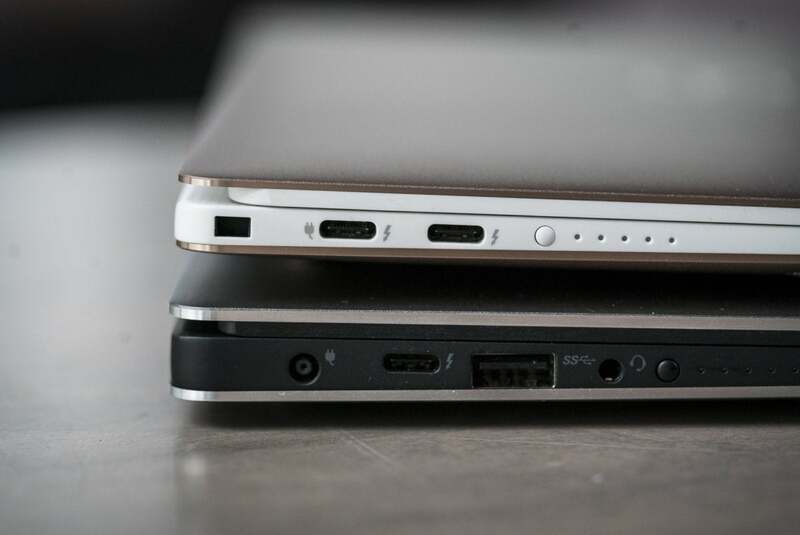 Two Thunderbolt 3 ports and a courageous headphone jack on the new 2018 MacBook Air vs. two Thunderbolt 3, one USB Type-A, a microSD reader, and headphone jack on the Spectre x360 13. The key spec in all of this is the HP's USB Type-A port, which we'll take over dongle hell. 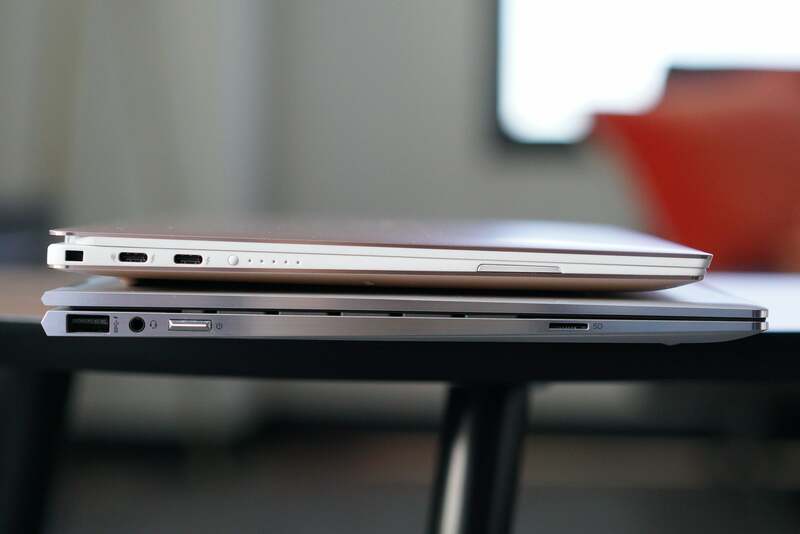 Apple spec's the MacBook Air at 2.75 pounds, while HP spec's the Spectre x360 13 at 2.78 pounds. That's what we call a tie. 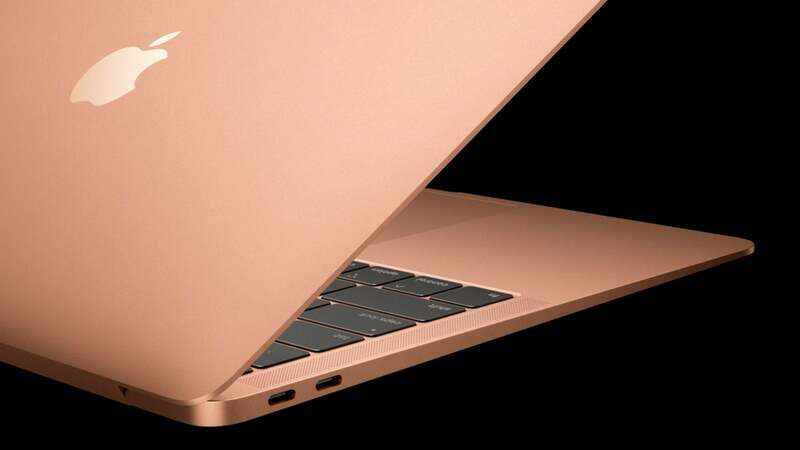 While we haven't tested the new MacBook Air, we expect battery life to be similar to that of the Spectre x360 13. Apple says you get about 13 hours of run time on a local video file, which is about what we get on the HP Spectre x360 13. And yes, Apple's screen is higher-resolution, but its CPU is a far worse in performance, and it doesn't have touch and pen support. Let's just agree that this one is going to probably end in a tie. The base 2018 MacBook Air is $1,200 with dual-core Core i5, 8GB of RAM, and a 128GB SSD. For $950 (as we wrote this), HP gives you a quad-core Core i5, 8GB of RAM, and 256GB of storage. While the Apple gets you a higher-res screen, the HP gives you touch and pen support. What's a little nutty is that to reach the RAM/storage parity of the $950 HP, you have to spend $1,400 on the 2018 MacBook Air. As they say: That dog don't hunt. Both Dell's XPS 13 9370 and HP's Spectre x360 13 offer compelling reasons to be chosen over the new MacBook Air.